Actualizar o Picto-Selector é fácil. Vá a "Ajuda" > "Procurar actualizações". new pictogenda pictos. They are updated for the new agenda next year. 3 new layout templates for "Big Point" and "Step by Step"
Support of Hebrew and Arabic (and other non Latin languages) in the pictosheets. Before characters were not properly stored. A bug when editing the pictosheet properties. Under some circomstances a exception was raised. The facebook button in the print preview. I removed all links to facebook in this version. Autoexport This options is used by people who create a schedule for each day at the start of the week. They save those pictosheets to a folder on their network and use those images on a tablet that is located in their living room. Every day the corresponding images is shown. Saving those pictosheets to a network location was taking some extra time and they asked if it could be automated. It is hidden by default and can be activated by changing the settings in "Settings" > "Administrator Settings" Here you can activate the option, select a folder and the extension to which pictosheets should be exported. Each pictosheet has now a setting ("Settings" > "Pictosheet Settings") where a name can be entered which should be used for the export. And the export can be enabled for this pictosheet. In the "Tools" menu there is a option to perform the auto export. All pictosheets which have an enabled autoexport are now exported. When you already are using the black and white pictos then you can use this download to add only the new images. 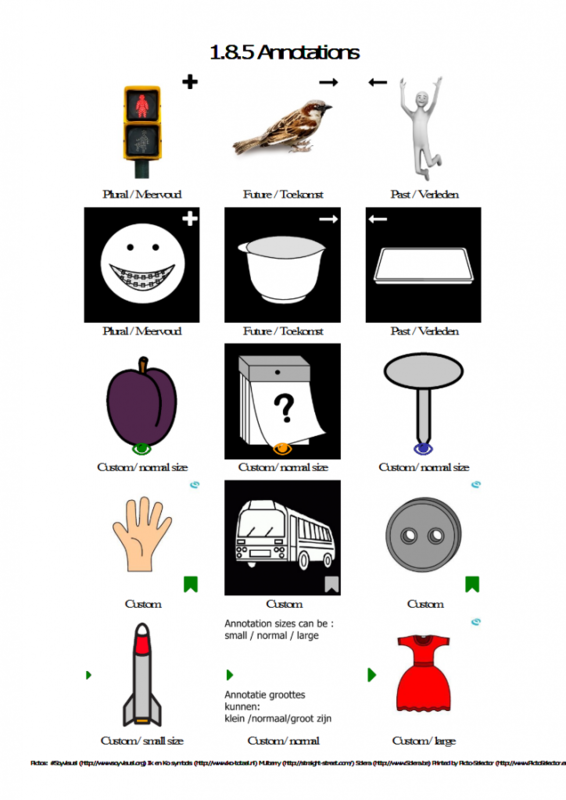 Pictogenda stickers 2018 layout template is centered now, according to the new edition of those stickers (published on 1 december 2017), earlier edition of the stickers can be used with the move option. Tip for printing stickers: First print on normal paper and put the print behind the stickers before a light. This way you can see if the pictos are printed in the correct position. Then you start the bingo generator and select this pictosheet and the bingo layout you want to use. Use "picto title" in sheets and pages instead of "picto name" and "picto description"
Tags for pictosheets in the picto list. Use the right mouse button menu to set tags to a pictosheet. This will be used to group the sheets into folders in the pictolist. When no tag is set, the <no tag> is selected. When you want to rename a tag for 1 sheet, you unselect the ‘old’ tag and type a new one. When multiple sheets have the same tag(s) you can do the same as above for al those sheets at once. I am already working on improving the tags functionality, to make it easier to rename or delete a single tag etc. Time Timer clockwise. A Time Timer which works like a normal clock. The image used for the empty picto was confusing for people. 276 Arasaac black and white pictos. If you want to download only the new black and white images you can get them here. “Empty Picto” to picto pages, use this with the “Fill Empty” option to quickly add pictos from the picto list or toolbar to your picto page. This “Empty Picto” can have a border and all other options which will be used when inserting pictos. Added the option to use the pictosheet wizard when creating a new picto page. Added the “Fill Empty” option besides “Insert” and “Overwrite”, now using dropdown with images to change this. Improved the conversion from picto sheet to picto page. Picto sheet wizard: Splitted the layout options in two steps. Bug: exception when overwriting a picto in the picto page which was used for a right mouse button menu before. Bug: with too many rows / columns and fixed distances between them, sizes of pictos became negative which resulted in exceptions (fixed by using a minimum size for pictos). When you are already using the black and white pictos of Arasaac then you can download a smaller package with only the new new pictos . More information about the black and white pictos can be found at the download page. Windows large font setting is now properly supported. Until now the print preview was not correct with a very large margin at the right and bottom of the page. 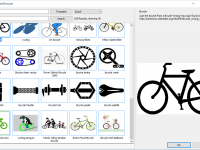 Drag and drop of image files from Windows explorer and browser can now be used to add a picto to a pictosheet. A photo picto will be added in dynamic pictosheets and a image in a flexible sheet. Add borderstyle to pictosheet pictos, not only a solid line is now possible but also dotted, slashed etc. Swedish translation of application, thanks Magnus Österlund! Network pictos dialog had a wrong title. Large networks – office mode will now rename existing pictosheet files to a backup file before saving. Textbar picto It is now possible to add a text which is spanning multiple columns. After this textbar you will need empty pictos. You can set the number of columns you want to use for each textbar.